Hello Loves! I have eight gorgeous Gel Polish shades from Madam Glam to show you today. These are the newest additions to the Madam Glam line, and they do not disappoint. The more I swatch from the Madam Glam Gel Polish line, the more in love I become. Seriously, the formula rocks and the shimmers...oh my! Ready to see them? First up is one of my personal favorites. Milkyway (#960) is a dark, silvery grey with green undertones. Yeah, grey isn't that exciting, but this one offers perfect coverage in two coats and is loaded with iridescent rainbow shimmer! My standard swatch pose with the bottle doesn't quite capture it, but you can see the sparkle better in the second shot. And because I swear I'm not crazy, how about a brush shot that really shows the dimension? She's so freaking pretty! Madam Glam has absolutely nailed it with these iridescent rainbow shimmers. Fairy Tale (#329) is a versatile, dusty grey shade with lavender undertones. This one is also loaded with gorgeous shimmer and is a two coater. I adore these finishes. They're frosty and metallic, but not streaky like many frosts. Here's another brush shot. So richly pigmented! Ready to see some color? Bombshell (#162) is a dusty pink base that is loaded with glittery shimmer. 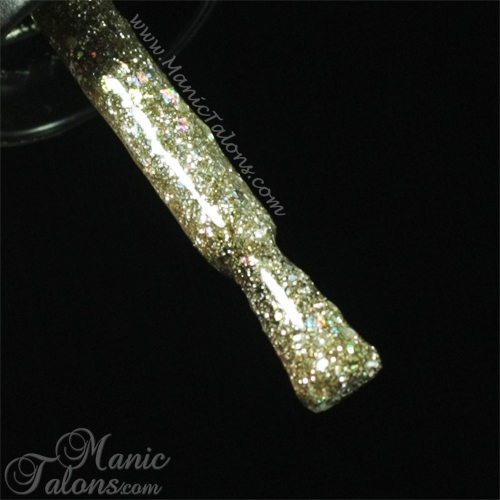 It appears frosty on the nail, but applies smoothly without streaks in the shimmer. Like most of the gel polishes in the Madam Glam line, Bombshell is nearly opaque in one careful coat and absolutely opaque in two coats. Here's a brush shot that really shows the dimension of the shimmer. It's not really needed for this color since the nail shots show it fairly well, but I took one anyway. If you prefer your pinks a little bolder, check out Glamorous (#327). Glamorous has the same dense silver shimmer as Bombshell, but in a much pinker base. This one is a true classic with a kick and a two coat formula. Speaking of shimmer, how about a deep purple shimmer in a blackened purple base? Shimmer Lavender (#238) is just that. And, y'all, she's another perfect two coater! Sandy Sparkles (#061) is a bit different from the others in this group. This is a beautiful, peachy orange jelly base that is loaded with shimmer and small holographic glitters. I did find that I needed three coats for full opacity, but it's totally worth it. Keep in mind that my coats are thinner than the coats most people apply, so it may still be a two coater for you. She's absolutely stunning though! You can see the jelly base better in this brush shot. Finally, Stardust (#117) might be the most amazing polish in this post. We're talking full coverage glitter in two thin coats! I am beyond in love with this golden jelly base that is loaded with golden shimmer and two sizes of silver holographic glitters. The result is a full coverage gold glitter polish with slightly silver tones...if that even makes sense. Ah heck, just look at her! I'm not going to lie...as soon as I pulled the brush out the bottle, I knew Stardust was destined to be used in a St. Patrick's Day mani. And I have the perfect Madam Glam shade to pair her with - Glittery Emerald (swatched here)! 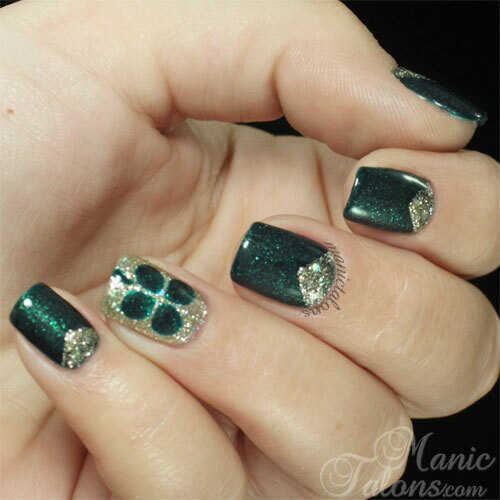 The glitter at the moons was a bit of an afterthought, so it's not as smooth as it could be application wise, but this mani has been hugely popular. I've been wearing it for a few days now and no less than 7 students from other departments have stopped by my station and asked if I will do their nails after seeing it. :) This makes the second mani using these new shades that has stopped people in their tracks. Seriously, if you haven't tried a Madam Glam Gel Polish yet, you have to try it! With over 350 gel polish swatches under my belt, it takes a lot to impress me these days. It really does (and it's kind of sad, but that's a topic for another day). Sure, I have my favorite brands and gush over them, but Madam Glam blows my socks off. I want all of the colors! Of course, you don't have to take it from me. Just check out Andrea's Madam Glam review on Chickettes. She was downright giddy over the formula. When we are both this excited over a brand, you know it has to be golden. 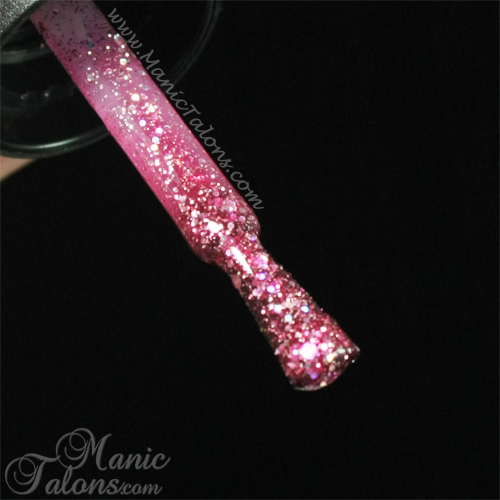 Be sure to check out my Madam Glam Swatch Gallery to see the other Madam Glam Gel Polishes I have swatched so far. Eventually, I hope to swatch them all! Once I finish nail school I will need top quality gel and reg. nail polishes. 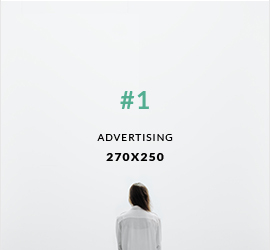 What brands are top? I am really annoyed with streaky reg. nail polishes and need help with brands that are without a doubt best. Is Madam Glam gels salon quality too? Thanks for the awesome posts! MG is salon quality but is not salon exclusive. Though I have requested the MSDS for them and will likely use them for clients. For a pro only product, I'm loving Akzentz. Its a little pricey for those of us in the US, but the formula is nice. For a budget line, check out Revel Nail. I haven't decided on a regular polish line yet. I was squealing with delight when these swatches popped up on Madam Glam the other day. :) You make choosing sooo much easier. Except for the part about wanting them all. :) I can't wait to try some of these. oooooo thank you!! You just swatched a few I had eyeballing and their "color circle" on the site just did not convey how amazing they are!!! Finally a gel with tons of glitter and frost metallics! ...and the brush shots are most appreciated! By the way, are the Bundle Monster thermals coming up soon? Trying to choose from those color dots is making me nuts. I just got Honeydew, Vintage Blue, and Deep Sea Dream in the mail. They swatched fabulously (Honeydew and Vintage Blue are pretty much one coaters for me) and I'm hoping for the same when I wear them. Now I'm thinking I need to get Stardust and maybe a few others. Milkyway is very pretty. It reminds me of OPI On Her Majesty's Secret Service, maybe a little less blue. I am loving Madam Glam gel polishes. I have gotten 6 already. My only frustration is all the colors they offer aren't available on their website at any given time, even for pre order, so you have to keep checking back to see if they have popped up so you can order them.....sigh. Also want to thank you Michelle for your awesome pics and review in helping me choose colors. We are neighbors in a way as I live down the road in Evans and work in downtown Augusta :).